training and information regarding the latest trends and equipment available in the marketplace. importance of safety,” said Managing Director of Kinder & Co., Mr Neil Kinder. 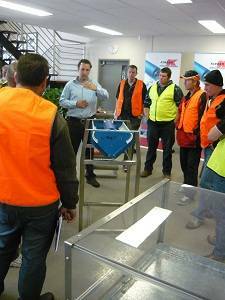 Kinder and Co were delighted to be able to host a training day for the Box Hill TAFE Cert 4 In Surface Extraction Operations students…demonstrating the correct application of Conveyor Hardware, assessing the appropriate product for Conveyor Tracking/Spillage and Managing Safety issues surrounding Conveyors. Certainly the OH&S bar has been lifted in recent years and the significance of keeping people in the loop was evident in the discussions. Charles Pratt Operations Manager (DipME), Peter Wei Senior Sales Engineer (B.Eng CHEM) and Marc Selby Sales Engineer (B MechEng) presented sessions on Flow and Anti Wear, Conveyor Transfer Points, Dust Sealing, Belt Protection Conveyor Guarding and Belt Tracking. close look at the correct positioning of equipment on a working conveyor, and demonstrating clearly what does what. Kinder and Co has developed an excellent relationship with the IQA and CMPA since the company’s inception in 1985 and prides itself on its innovative products that provide Bulk Materials Handling Solutions to the extractive industry. All Sales Engineers regularly appear as guest speakers at industry events and conferences, using their knowledge to educate the attendees. As industry leaders they can be relied on to bring the latest technology to the marketplace.